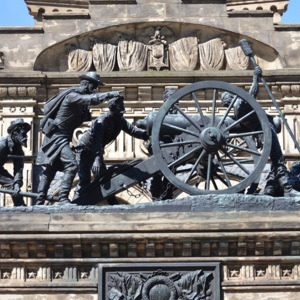 On the fifth of May 1888, the Cuyahoga County Soldier's and Sailor's Union unanimously approved a proposal to erect a massive monument, meant to commemorate the men and boys from Cuyahoga County who contributed to the Union's resounding victory in the Civil War. 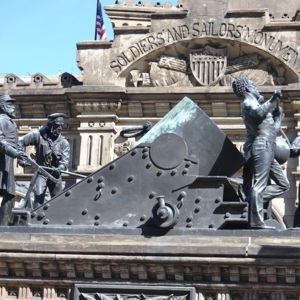 On July 4, 1894, the Soldier's and Sailor's Monument was dedicated in Cleveland, in Public Square where it still stands today. 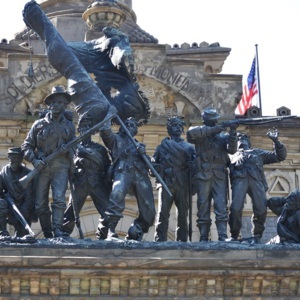 The monument consists of a 125 foot tall column, whose base houses a memorial room. On the four sides of the base there are four bronze sculptural groups, each representing a different branch of the military. 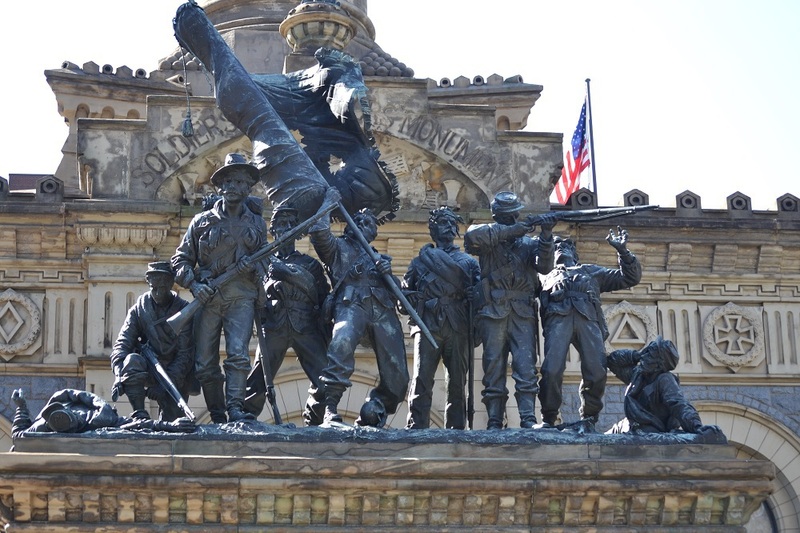 The Infantry group, entitled "The Color Guard", on the North side of the monument, depicts an actual incident from the war, when Sergeant Martin Striebler and the 103rd Ohio infantry stood fast against enemy forces in defense of the flag at the battle of Resaca. 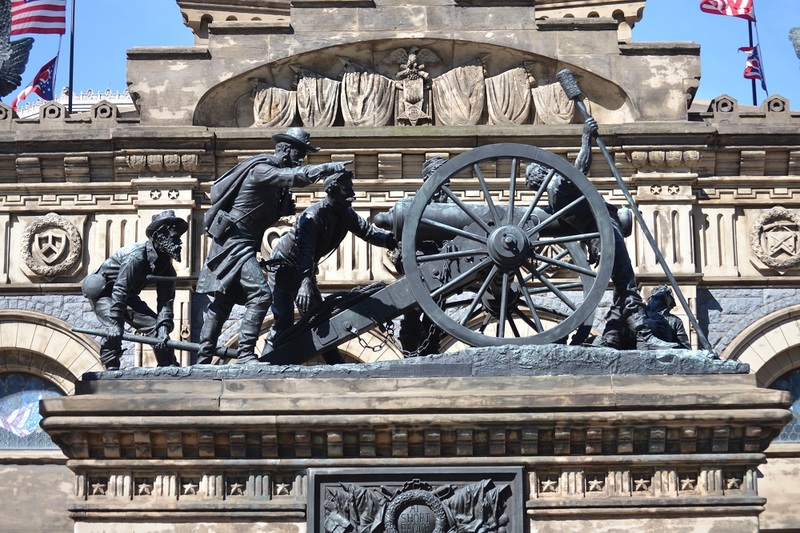 The Artillery Group, "At Short Range", to the East, depicts a grisly scene, wherein an artillery team persists through injury and death, to protect the Union lines. The Navy Group, "Mortar Practice," to the South, shows a team of five men and an officer prepare to shell enemy entrenchments along the Mississippi. 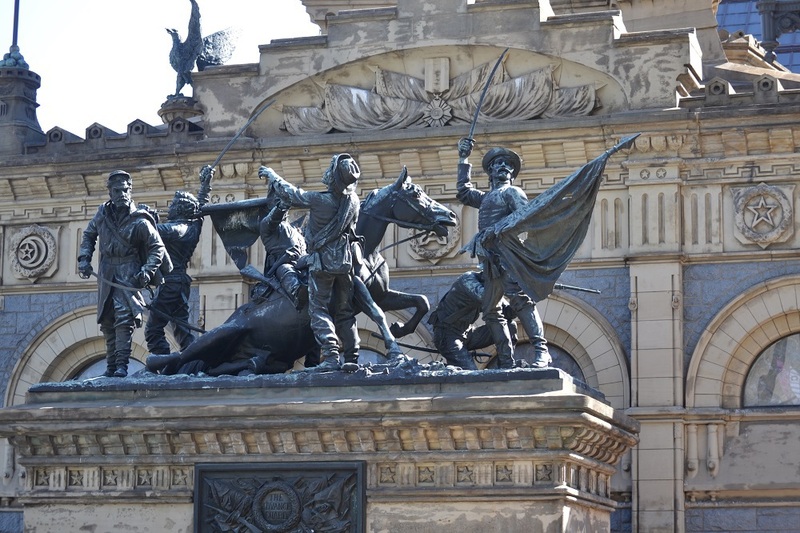 And finally the Cavalry Group, "The Advance Guard", to the West, shows a fatal conflict against Confederate troops. A Union soldier, with his horse taken down, delivers one final shot to the face of a Rebel soldier. Meanwhile, a Confederate officer raises the flag of the South and calls his men to charge, as a Union Rifleman takes aim and a Yankee bugler sounds off for assistance. 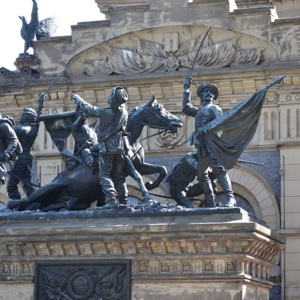 Confederate figures were included in this historical group to show progeny what the Confederate soldiers and their flag were like. On top of the massive column, ready to defend the city and its people, stands Lady Liberty, the Goddess of Freedom. 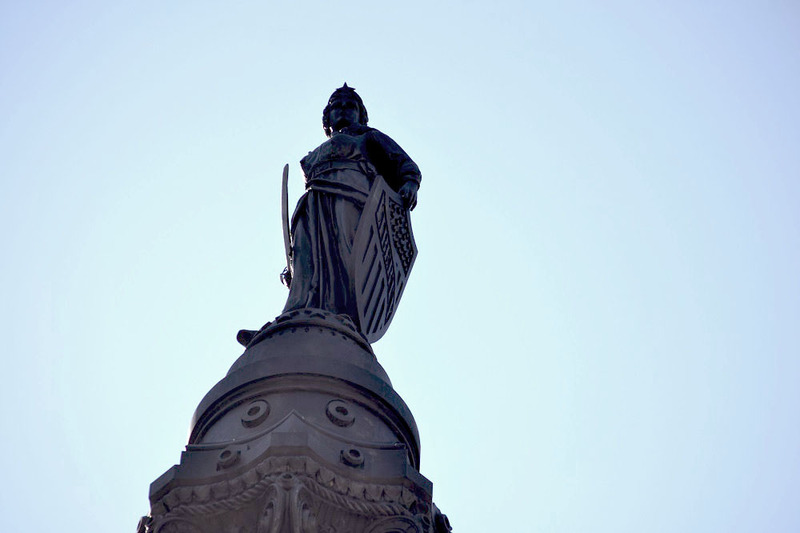 She holds a shield bearing the word "LIBERTY" in her left hand, and her right hand holds a sword. She is dressed in a French officer's overcoat, and she gazes confidently into the horizon. 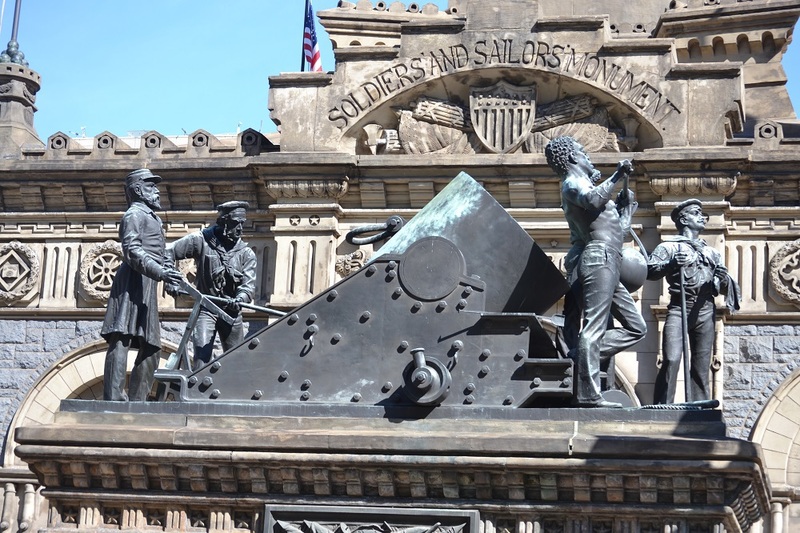 : Levi T. Scofield, “Soldiers' and Sailors' Monument,” Ohio Outdoor Sculpture Inventory, accessed April 22, 2019, http://oosi.sculpturecenter.org/items/show/211.